The best investment account for investors depends on a lot of variables. Saving on taxes, in the long run, is usually the primary driver to select one account over another so your personal situation plays a big factor. Prior to the introduction of the TFSA (Tax-Free Savings Account) as a savings account, the decision process was pretty simple. The RRSP (Registered Retirement Savings Plan) would be the choice and then the RESP (Registered Education Savings Plan) would be considered once you have children. Since 2009, when the TFSA was introduced, there has been a debate on where to put your money first; TFSA or RRSP? Get an immediate tax break with RRSP or avoid paying taxes on withdrawals with a TFSA; these are questions without a simple answer. It all depends on your own situation. Before we dive into the steps to choose an investment account, it’s important to differentiate between the investment accounts and a discount broker. An investment account is generally set up by the government to provide certain benefits with guidelines on how the accounts should be used. The purpose is mostly around incentivizing individuals and family to save money for retirement and education. Such accounts are TFSA, RESP, RRSP, RRIF and non-registered. Each of the accounts has a number of rules and discount brokers have to work with investors to ensure rules are followed otherwise there can be financial penalties. Each of the accounts will usually have a different set of income tax rules and they factor in your decision to add or withdraw money from the account. In general, these accounts will have a unique account number and can also be available in different currencies. A discount broker is a service provided by financial institutions to execute equity (stocks, ETF, mutual funds, or bonds) transactions. The transactions are executed from one of the many accounts listed above. Discount brokers provide different features to help manage your portfolio and not all of them are equal although they mostly have a similar set of base features for the majority of investors. See the discount broker review for dividend investors for a comparison. In fact, transfer agents provide a type of non-registered account for investors and can also be part of a company plan. It’s simply another type of financial institution provide a service for companies and investors. Discount brokers, or financial institutions, provide a platform to manage many of the accounts you, and your family, hold. In general, during the accumulation years, investors will have the following options for their accounts. Each Canadian investment account has a corresponding US account (or vice versa). If you want to find out your Canadian or US equivalent account, check the chart below. The decision process below will be based on Canadian accounts and taxes. Feel free to make the adjustment if you are Americans based on the income tax code but a process like the below should simplify your decision. You have some money, which account deserves your hard earned capital to be invested. Follow the steps below to help guide your decision. 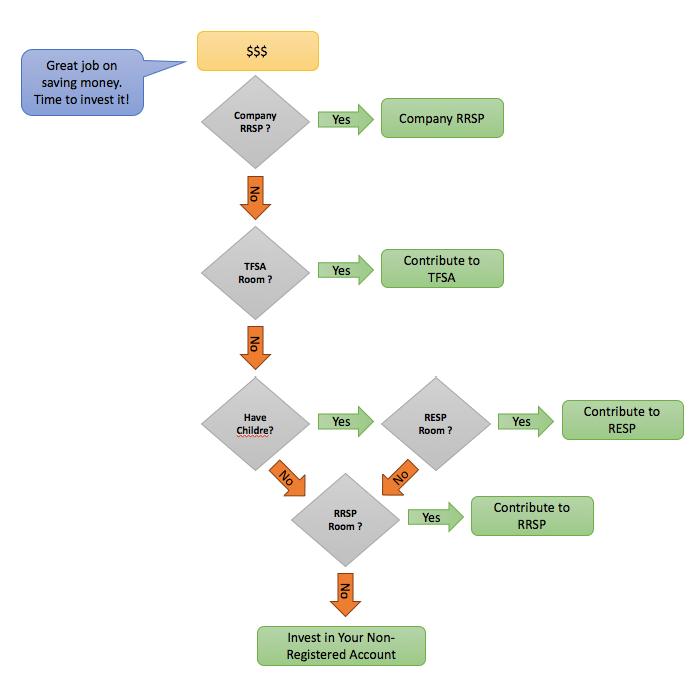 Do you have an RRSP company matching contribution? If yes, make sure you have not exceeded your contribution room, and deposit the money to your maximum allowed contribution. Get that contribution from your employer; it’s free money. Chances are you have access to some mutual funds and it’s probably best to just pick an index fund. Over time, if you are not satisfied with the investment options, inquire as to the penalties for transferring your own contributions to your RRSP account. I do transfer my contribution to my own RRSP to invest in dividend growth stocks rather than the index funds. Do you have available room in your TFSA account? If yes, maximize your TFSA contribution. Even if you want to get a tax refund from an RRSP contribution, if you can only fill one account, do the TFSA first. Chances are your tax rate isn’t high enough to really benefit from the RRSP tax refund – especially if your plan is not to reinvest it. The idea is that when your income goes up, you can take your TFSA and move it to your RRSP once you are in a higher tax bracket. There will be personal finance recommendations where the TFSA is a place to hold emergency funds or down payments but that is really a short-term decision to avoid paying a little bit of taxes. My recommendation is to treat your TFSA as a retirement account that you won’t touch for 20+ years. Let compound growth do the work it needs to do with time. While the word ‘savings‘ is part of the name, it’s not meant for short-term savings. There is nothing preventing you from treating it like a short-term savings account but you should really find a way to maximize it every year for retirement. Do you have children? If yes, you should put money in your RESP account to maximize the government’s contribution grant. Even if you expect your children to pay, use the RESP account to get the grant from the government, invest it wisely and have your children benefit from the government grant. It’s free money you can invest to make more money at no cost to you. If you have room in your RRPS, contribute to your RRSP to maximize your contribution. If you are married, consider a spousal contribution to maintain a balance between the spousal accounts. The benefit of balance accounts is on withdrawal prior to a RRIF for income splitting. If you wait to withdraw once you reach the time you need to convert to a RRIF, then you don’t have to worry since you are allowed to do income splitting. If you get here, you are doing really well with your savings rate and you should invest in a non-registered account.